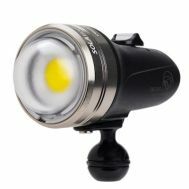 The new Sola 9600 Pro delivers more FL-1 certified lumens than any light in its class. it is a ground up new design leveraging the latest LED array and driver design along with direct cooling technology for the highest output possible in the smallest size. 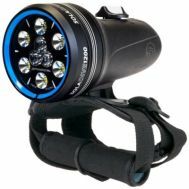 Sola Pro's new design incorporates Light & Motion's new patented "direct cooling technology" which allows the LED, driver, and high capacity battery to operate with increased performance to give the user more power and longer runtimes. other product features include an OLED (Organic LED Display) to manage and monitor power levels, battery and charge status. The new "Fast Charge" internal Circuit eliminates reliability issues that come from external chargers and recharges the light to 80% full in less than an hour with full charge in 1 hour and 45 minutes. The factory-sealed housing with easy-to-remove faceplates makes the Sola Pro reliable and travel friendly. 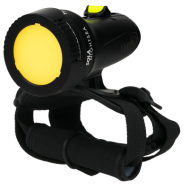 Every aspect of the Sola 9600 has been designed to enhance the user experience with the aim of creating the most reliable, compact and powerful light in the industry that can still fit in your backpack.